As my healthy-ish eating continues after an over-indulgent holiday, I just couldn’t stop dreaming about a bowl of pasta. 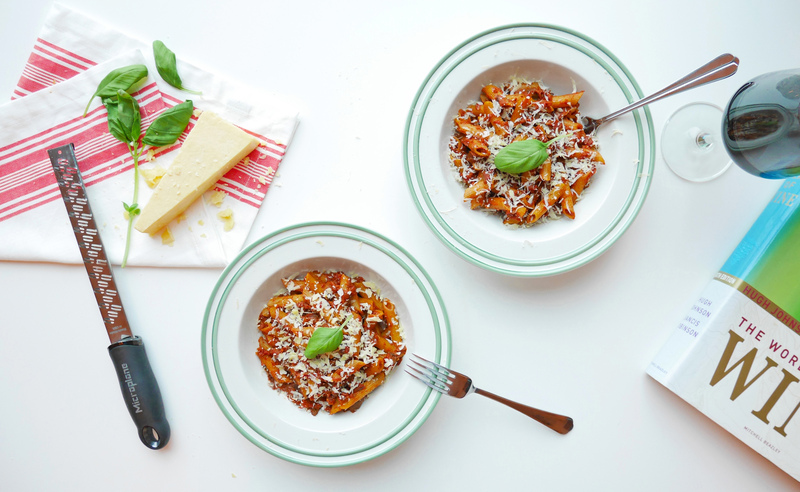 Honestly, who doesn’t like pasta? 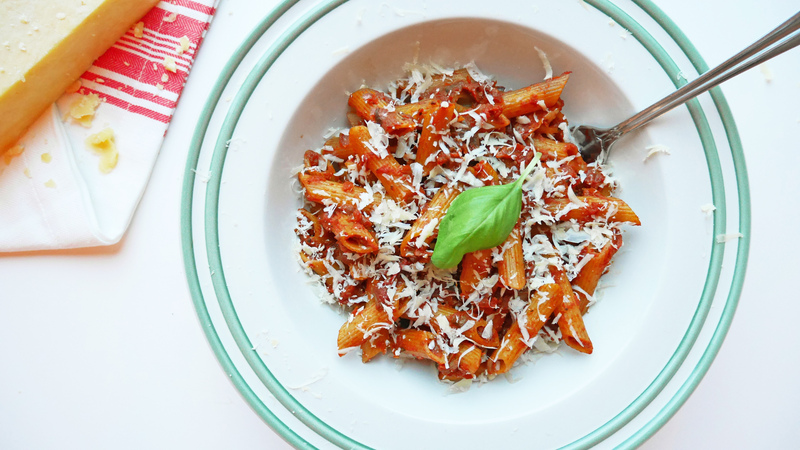 I think the world will become much happier place if we can all eat pasta everyday without worrying about the carbs…Anyways, I have kept some whole wheat penne in my cupboard so I’ve decided to make rich tomato sauce to go with it, but without any meat or seafood. Instead I am using dried ‘funghi porcini’ (porcini mushrooms), which will give the sauce great depth of flavor. I came across with these magical little ingredients a couple of years ago, and I rarely leave them out when I make meatless tomato sauce. In a mug place dried porcini mushrooms and cover with a cup of water. Soften them for 10 minutes. Meanwhile, prepare onion and garlic and set them aside separately. When the mushrooms are softened drain and leave them to cool. Save the water from drained mushrooms. When they are cool enough to handle chop finely. In a medium heat pan (about 25cm x 5cm or 10” x 2” deep), add 2 tablespoon of olive oil and onion. Cook for 4-5 minutes or until soften. Add garlic and cook for another minute. Stir in plum tomatoes with all their juice. I do not like to waste any of the juice, so I rinse the tin with water from drained porcini and pour it all together in the pan. Crush plum tomatoes with wooden spoon or spatula until they become puree like texture in a pan. Add tomato puree, chopped porcini mushrooms and dried oregano. Add 1/4 – 1/2 teaspoon of cayenne pepper if you want some heat as well. Gently stir, taste and season with salt and pepper to your liking. Bring the heat down to low and add vegetable stock. Sauce needs to reduce gently for about 40 minutes from this point. Keep an eye on the sauce and stir occasionally. Add a little bit of water if necessary. Sauce should be quite thick at the end. When the sauce has been reduced for 30 minutes, add penne in salted boiling water. Cook for 10 minutes to al dente. 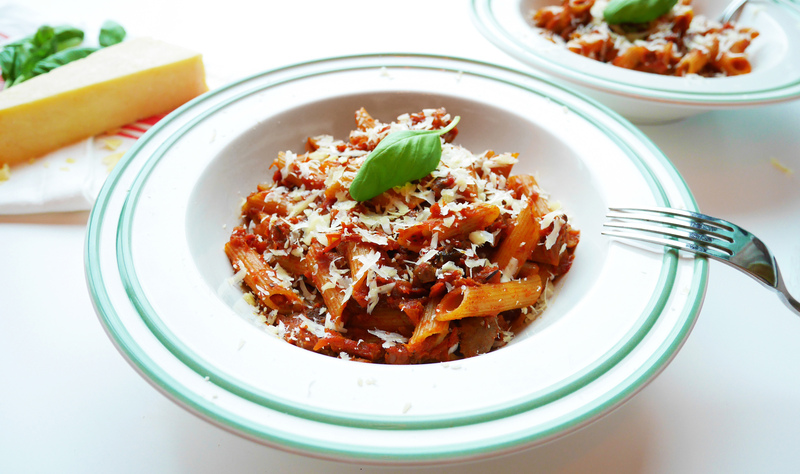 Before you drain the pasta add a ladle of pasta cooked water to the tomato sauce together with penne. Remove the sauce and pasta from the heat and mix well. 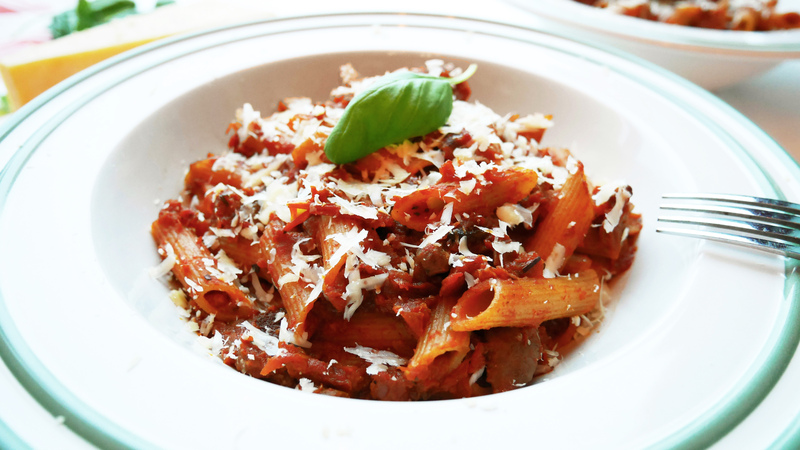 Plate it with freshly grated Parmesan cheese and basil leaves. Oh my gosh, this looks so delicious! It looks like a hearty sauce just in time for fall 🙂 Gorgeous photos!